We hired Sandmark Custom Homes 3 years ago to do a significant remodel to a beach home we purchased. Open air ground floor was enclosed creating a large workshop, garage, and patio area that included a new bath. Also built out for an elevator, added exterior stair system, in ground pool and landscaping. Project involved all aspects of construction (plumbing, HVAC, electrical, structural, interior finish, etc.) We lived 650 miles from project and had to be comfortable that our contractor would handle things to our specifications etc. Mark Martin has proved himself to be very experienced and trustworthy. His workmanship and that of his subs was high quality and the entire project turned out great. We really appreciate that Mark was at our job site almost every day and frequently had tools in hand doing the work right along with his crews. The project was completed on time and within the budget we set. We recently hired him again to help with a major water intrusion issue on another beach property we own. He responded to our call for help and had a crew on site within a few days to address the problem. Water had penetrated behind the siding on three levels and the sheathing was rotten and the corner framing of the house compromised. Not only did he fix the damage but he also identified where the water was coming from which was a design/build problem when the house was first erected 15 years ago. He had his crew take the extra steps to eliminate that issue. Will not hesitate to call him again when we are in need of a contractor. Sandmark Custom Homes is grateful for all of our clients and their feedback to help our company to be the best it can be. We are thankful for the time we have been able to spend with the Amaris working on their home. 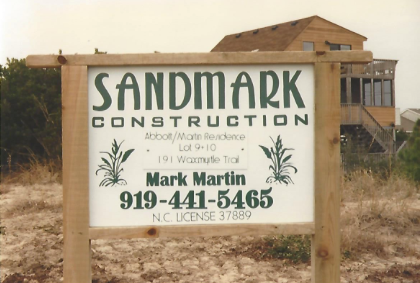 If you’re interested in starting a home renovation or building project along the Outer Banks, contact Sandmark Custom Homes at (252) 261-1123 or email us at sandy@outerbanksbuilders.com. We are happy to answer any questions you may have.